ACT Genomics is honoured to have 2 abstracts accepted for e-poster presentation at the 2018 World Cancer Congress (WCC). 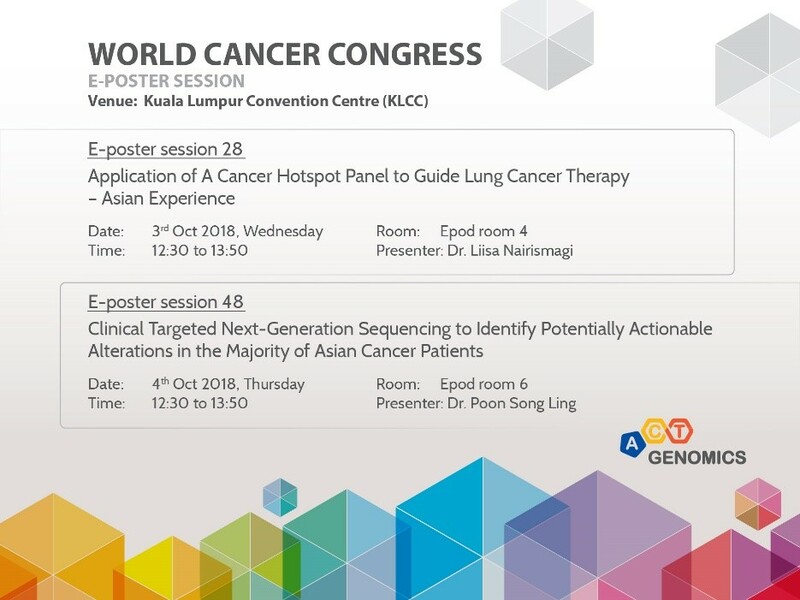 Hosted by the National Cancer Society of Malaysia, the 2018 Congress will take place from October 1st-4th in the Kuala Lumpur Convention Centre (KLCC). WCC is an initiative of the Union for International Cancer Control (UICC) - which was recognized with Membership Engagement Award - and supports the organization’s purpose statement to unite the cancer community, reduce the global cancer burden, promote greater equity and integrate cancer into the world’shealth and development agenda. WCC is a recognized international conference which encourages effective knowledge transfer and best practices exchange amongst 3,500 cancer control and public health experts from 150 countries.